Kiev, April 1: Comedian Volodymyr Zelensky is favourite to become Ukraine's president after results Monday showed him dominating a first-round vote despite many initially dismissing his candidacy as a joke. The 41-year-old's political experience had been limited to playing the president in a TV show but he leapfrogged establishment candidates amid public frustration over corruption and a stalling economy. Partial results published on April Fools' Day -- an irony not lost on Ukrainians on social media -- showed Zelensky taking 30 per cent in Sunday's first round, well ahead of incumbent Petro Poroshenko on roughly 17 per cent. The two will meet in a run-off vote on April 21 after ex-prime minister Yulia Tymoshenko and dozens of other candidates were knocked out of the race. 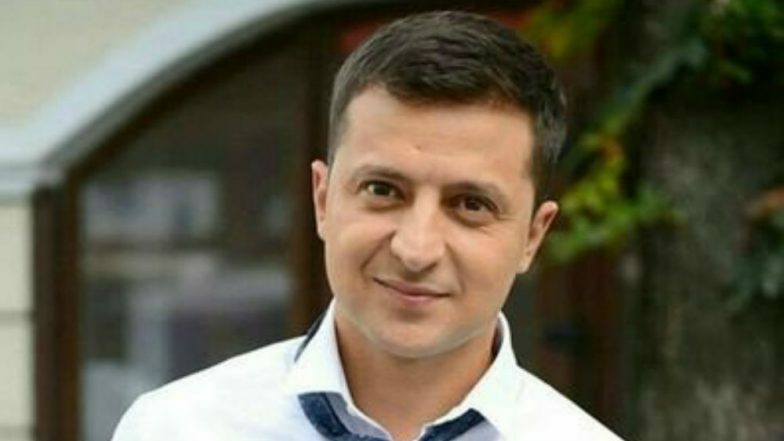 Ukraine Presidential Elections 2019: Comedian Volodymyr Zelensky Leads Opinion Polls Ahead of 1st Round of Voting. If Zelensky wins the leadership, as polls and analysts suggest, he will take the reins of one of the poorest countries in Europe -- a nation of 45 million people fighting Russian-backed separatists in its industrial east. "I want to thank all the Ukrainians who came out and voted in seriousness," the high-spirited actor told supporters after exit polls showed a better-than-expected result late Sunday. Zelensky had topped opinion polls for weeks and the main question going into the weekend vote was who between Tymoshenko and Poroshenko would meet him in the second round. But the size of his lead came as a surprise. Poroshenko said the result was a "harsh lesson" for him personally and for authorities as a whole. Tymoshenko, who came to international prominence as a face of the 2004 Orange Revolution and was taking her third tilt at the presidency, said the exit polls were "dishonest" and asked supporters to wait for final results. The central election commission said there had been no major violations during the vote, though the interior ministry said it had received hundreds of reports of irregularities. Political analyst Anatoliy Oktysyuk of Kiev's Democracy House think tank said it would be "difficult" for Poroshenko to knock the actor off course in the head-to-head round. "He (Poroshenko) has no room for growth. He has played all his cards," Oktysyuk told AFP. "This is a protest against the old elites and a call for new faces." Oktysyuk suggested Poroshenko would try to frame the contest as part of a wider confrontation between Moscow and the West -- presenting himself as the only candidate who could stand up to Russia's Vladimir Putin. Other commentators said it was too early to predict the result of the second round despite the comedian's commanding lead. Poroshenko came to power in 2014 after a revolution forced his Kremlin-backed predecessor Viktor Yanukovych out of office. The uprising was followed by Russia's annexation of Crimea and the separatist conflict in eastern Ukraine. The 53-year-old leader -- a chocolate magnate who was one of the country's richest men when he took office -- said he would shut down the fighting, tackle graft and align the country with the West. But five years on, the ongoing conflict has claimed some 13,000 lives, while many feel Poroshenko has failed to live up to the promise of the revolution. Despite concerns about Zelensky's vague platform, supporters insist only a total outsider can clean up Ukraine's murky politics. "A real democracy is when the result of the vote is a surprise. Congratulations -- Ukraine is not Russia, Ukraine is Europe," Kiev businessman and lecturer Valery Pekar wrote on Facebook following the result. Some accuse Zelensky of acting as a front for the interests of oligarch Igor Kolomoysky, who owns the channel that broadcasts the entertainer's shows, but he denies any political links. The actor eschewed traditional rallies and interviews in favour of playing gigs with his comedy troupe up to the final days of campaigning. The political comedy "Servant of the People" he stars in returned for its third series this week.